Ankylosing spondylitis is a chronic inflammatory disease of the attachment points between tendons, ligaments, or capsule and bone. It causes arthritis of the joints, mainly the spine and pelvis (sacroiliac joints). Ankylosing spondylitis can also cause inflammation of the eyes, lungs, or heart valves. In severe cases, new bone may develop between the spinal bones. This can cause some areas of the spine to fuse. This fusion will decrease the flexibility and movement of the spine. The cause of ankylosing spondylitis is not known. Some cases may be associated with a problem in a specific gene. The severity of symptoms can vary from mild to very severe. There is no cure for ankylosing spondylitis. Treatment is aimed at providing education and relieving the symptoms. In severe cases, hip or joint replacement surgery may be needed. It will be done to relieve pain and help you move around easier. In some instances, spinal surgery is needed to allow an upright posture. There are no guidelines for preventing ankylosing spondylitis because the cause is unknown. 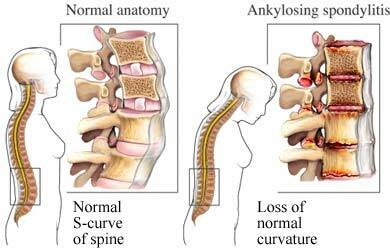 Ankylosing spondylitis. Spondylitis Association of America website. Available at: http://www.spondylitis.org/About-Spondylitis/Ankylosing-Spondylitis. Accessed November 10, 2017. Ankylosing spondylitis. University of Washington Orthopedics and Sports Medicine Department website. Available at: http://www.orthop.washington.edu/?q=patient-care/articles/arthritis/ankylosing-spondylitis.html. Accessed November 10, 2017. 10/2/2009 DynaMed Plus Systematic Literature Surveillance http://www.dynamed.com/topics/dmp~AN~T143424/Ankylosing-spondylitis : FDA approves new drug to treat psoriasis. US Food and Drug Administration website. Available at: http://www.fda.gov/NewsEvents/Newsroom/PressAnnouncements/ucm183851.htm. Updated April 17, 2013. Accessed December 17, 2014.